Then I use pre-cut watercolor paper that I attach drafting tape to (rolled up on the center of the back of my art card). The miniature sized 'canvas' is adhered to a piece of recycled copy paper. I use this as my test palette while I progress through the painting. Generally, I only need a one half sheet size for testing my colors. This allows me to use one piece of copy paper for up to four art cards - refolding it to find a clean surface as needed. 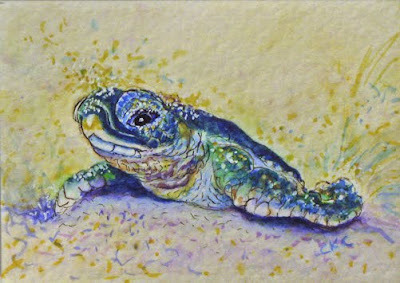 The finished painting: a newly hatched sea turtle beginning the precarious journey from sand to sea. I had the pleasure of working with one of the most endangered of these beautiful creatures - Kemp's Ridley sea turtle from the Gulf of Mexico - many moons ago. What a wonderful experience it was to care for several very healthy active individuals. They grew so quickly and thoroughly enjoyed their meals of fish, squid and scallops. At feeding time - it was literally a splashing fest! The care taker was always soaked - I gave up on the apron idea very early on as it did not do much to keep my face, neck and shoes dry anyway. Visit Coral2Cove Gallery to view this art card. 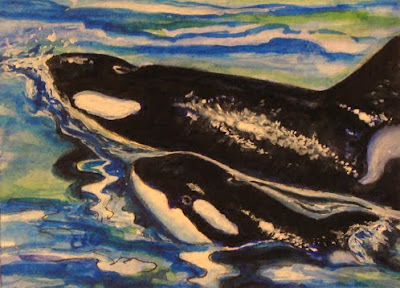 Orca whales are a favorite subject of mine to paint. I love the high contrast of the lights against the darks and their sleek appearance as they glide effortlessly through the sea makes them a joy to capture on art cards. Here is a recent painting of a mother and calf as it progressed. 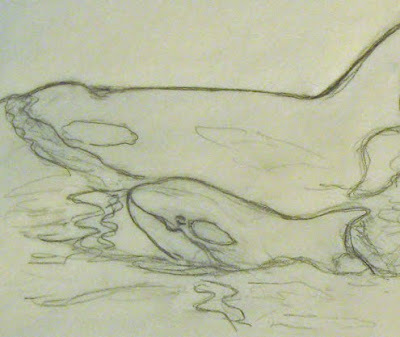 First a sketch in pencil is drawn of the orcas swimming at the surface. 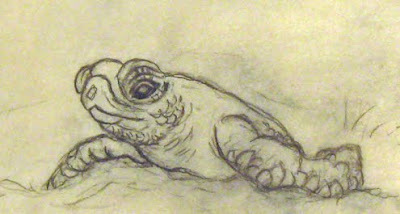 After transferring this image to watercolor paper, ink and a wash are added. Background washes are the first area I apply paint. After saturating the background areas of the paper with water, colors in a wet on wet technique are added. This gives a nice flowing and blending effect. 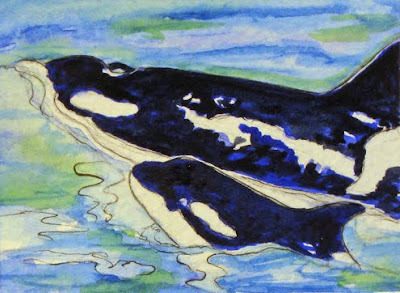 Also, for my orcas, I always under paint with blues or mauves depending on the surrounding lighting. This painting has ultramarine blue added first to the whales, then several layers of Payne's gray. Highlights are left white or in some cases, added towards the completion using Chinese white. The finished painting includes the details and the calf's dorsal fin was set back slightly from the original sketch. Welcome, my name is Colleen K Carrigan and as a naturalist/artist, I have devoted many years to animal behavior studies and nature observations. 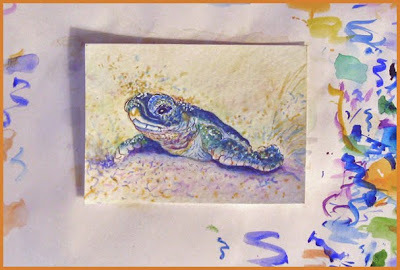 I thoroughly enjoy producing OSWOA (Original Small Works of Art) and art cards - ACEO's - (Art Cards - Editions and Originals) miniature treasures trade card size 2.5'' x 3.5''. Here is one of my recent watercolor and ink paintings. 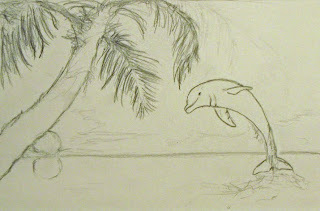 I generally begin with a sketch. Then, after transferring the image to watercolor paper (making alterations as needed) - ink is added over the outline using a Pigma Micron 02 archival ink pen. These pens work wonders - and don't blend when a wash is added moments later. I start with a background wash then add layers of color. I love rich vibrant hues and often under paint areas where red results with shades of yellows to brighten the reds. 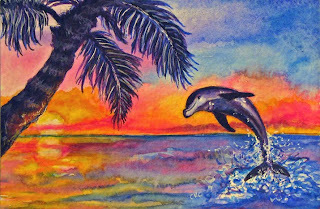 This painting had a couple of changes from the sketch - the palm fronds were moved slightly and the horizon was raised to enhance the contrast between the darker water and the dolphin's splash. This 4"x6" OSWOA is available in my Coral2Cove eBay Gallery.